To begin with, I am writing to bring to your attention to what I consider a serious error in my recent selection as Foreign Teacher of the Year in South Korea. As I valiantly tried to point out to the awards committee, I was only visiting this country for a month and was simply helping a few of the Sisters at the St. Mary’s High School with their English. Teaching a class of nuns does not strike me as being worthy of any kind of special recognition. For one thing, I had no discipline problems at all. And yes, I refrained from becoming romantically involved with any of them, but it wasn’t as difficult as it sounds. I will admit that during this time I was working without a salary, but the committee’s declaration of this as a shining example for other foreign instructors here to aspire to strikes me as misguided. In any event, I have reluctantly decided to accept the award: a round trip ticket to Tacoma, Washington (also known as “The Paris of South Puget Sound”). Strange that the second place winner will receive two round trip tickets. But I will try to use them as soon as I receive them. Now, at the risk of causing an international incident, I must nevertheless continue to protest your decision to present the award next week at St. Mary’s school. The 8:00 a.m. time in particular strikes me as especially inappropriate. I mean, have you ever actually SEEN an early morning Korean high school class? Some of the students (most of whom study four to five hours a night before leaving the school at ten) wobble in like twelfth-step alcoholics following an all night binge. Others lie sprawled across their desks, semi-conscious. An ambulance team presented with this scene would find itself performing emergency triage. May I ask what, exactly, are you preparing your students for, extended POW internment? High School should be one of the best and happiest times of our lives (and would have been in my case if it wasn’t for the acne attack my junior year). From what I have seen of your educational system, it’s only a matter of time before President Bush sends over a hostage rescue team, then orders a follow-up air strike. Do you really want to visit Guantanamo Bay that badly? I know, I know. Foreign teachers in Korea, like small children, should be seen and not heard (and maybe not even paid). I just felt it my place to use my brief, exalted status to speak my mind. And having the Education Ministry Police confiscate my passport will not change my views nor my plans to escape. For I, along with a dedicated group of seventeen-year-old freedom fighters (who, by the way, have permission from their parents), are determined to break out of this educational hellhole, bound for a place where we can teach and learn in genuine harmony. Under the cover of darkness we will boldly strike forth…for the Worker’s Paradise of North Korea! Today we are going to have lunch in a Pusan restaurant in Korea. Can you say “Pusan”? If you are unable, don’t worry as that is going to be the least of your problems. The area of the city we will have our meal in is called Haeundae Beach. Because of its popularity with foreign tourists, most of the restaurants have pictures of their dishes posted outside. As an aid to understanding what you are going to eat, the names often have Japanese subtitles. A big help for those of you who can read Japanese (and what red-blooded American cannot?). As you scan the photos, you will notice that red is the predominant color. Meaning spicy. Meaning be careful! The Korean martial art of Tae Kwon Do actually utilizes some of the local cuisine as a means of attack, so it will behoove us to make our choices with care. Your first impulse will probably be to try and figure out what the hell the dishes are. This would also be your first mistake. If you by chance end up ordering something like octopus tentacles in eel sauce, ignorance is bliss. OK, we’ve selected a restaurant and have pointed out the meal we want. Usually this will be some kind of stew or soup. While waiting for the order to arrive, you will notice the waiter bringing half a dozen small plates of various colored organic materials to our table, little of which resembles food as we know it. These petri dish arrangements are in side dishes, intended to be enjoyed with the main course. Let’s get to work! Choose the dish that appears to be the most appetizing and use your chopsticks to dig out a small portion. Quickly put this in your mouth and begin chewing. Do not stop to think about what you are eating! We are simply trying to get some of this stuff out of the way without offending the waiter through gagging or involuntary regurgitation. Once you’ve got the first bite or two down the hatch, move on to another selection and repeat the process. One of the side dishes will be a kind of cabbage in a red sauce with red sprinkles. 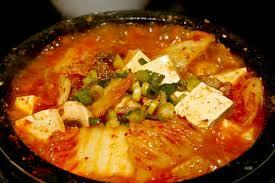 This is called kimchi and is a Korean favorite. It is made by burying the cabbage with spices and letting the concoction ferment (as in rot) for a few weeks before finally digging it up and…you know, on sec-ond thought, let’s skip the kimchi preparation details until well after the meal. At last the stew or soup arrives… But wait a minute! It doesn’t look at all like the picture. Where are all the scrumptious vegetables? And what is that big white thing floating on top? Are they breaking in a new cook to-day? Unfortunately, there’s nothing you can do. The contest has come down to you and the stew, and only one of you is getting out alive. Begin the attack by deploying the bowl of rice that came along with the other side dishes. For Koreans, this is almost always eaten separately. But not for you! Take the small metal bowl the rice comes in and scrape some of it into the soup/stew. Do this in jerky, clumsy motions to make it look like an accident. What we are attempting here is to mix in the rice to dilute the napalm-like potency of the stew. Even then you must eat cautiously, following every spoonful with almost waterboarding-level self-dowsing. Determining when you are done is a tough call. The table will look like a food fight has taken place, with enough left over to go into hibernation with. But set aside your mother’s admonitions about cleaning your plate. There are no extra points for neatness here. If you are full, call it a night. As you pay your bill, be sure to smile at the waitress (who has to clean up your mess) and the cashier as your stomach prepares to reenact the eruption of Mt. Vesuvius. As you wander out onto the street, begin looking for your next destination: a pharmacy that sells Pepto-Bismol.